When did all these charities sell out to the corporate world and the excuse of 'independent salary review experts' determining salaries for their CEOs? How many international accountancy firms have been involved in plucking figures from mid-air to determine how much the RNLI fork out to a paid head when most of the people involved are volunteers? These days all charities with a certain income must disclose the salary being paid to the highest paid member of staff. This is quite horrifying to discover. I cannot believe that in this day and age a charity needs to pay a salary at this kind of level to attract someone 'good' to the role of CEO or to head up a particular part of a charity. I appreciate entirely that charitable organisations like the National Trust and the Consumers Association which, lets face it, are more like businesses with the public as shareholders in any event, are going to pay their staff reasonable salaries. It is inevitable, although questionable in terms of their aims and mission statements. I think that charities ought to be made to print the statement on any of their literature to say that any donations made will pay for staff salaries, with a note of the highest salary being paid. This way the general public can make an informed decision on whether or not to donate to a particular charity. There is a feeling when reading these figures that the charity sector has turned into a business and that the way to make money in the business is to get a CEO job. You virtually become a shareholder at this kind of level of income, and I think it is utterly disgraceful. After all, I could turn our business into a charity. We could develop charitable aims, arrange to become a trust with a trading branch and pay all our staff more money than we currently get as employees. We would be a charity, but the whole purpose of the business would still be to support the staff of the business, and this is, I fear, the current status quo with some of these charities. People protecting their own jobs and not appreciating how such salaries could be perceived by the general public. Why on earth does a CEO of a 'charity' need to be earning £12,427.92 net pay per month? What are they going to do with it? How much does he/she donate to charity? Update - we have launched a campaign to address excessive pay in the charity pay and this includes a petition before Parliament. If we can get 10,000 signatures the government will respond to our suggestion to remove charitable status from charities who pay any staff more than three times the national average wage. New for 2015 - Free Guide to Getting a Training Contract or Work Experience for Law Graduates, Paralegals etc..
We have had a Guide on our Legal Careers Shop for many years, but after 8 years we have decided it is probably time to update and upgrade it, particularly when the previous version talks about writing letters to law firms (no mention of email, which until c.2010 was still alien for a lot of law firms). A guaranteed failsafe technique for getting both work experience and a training contract. Answers queries you may have about legal recruitment agencies and whether they can help. Guides you to improving your chances on getting work experience or a training contract. 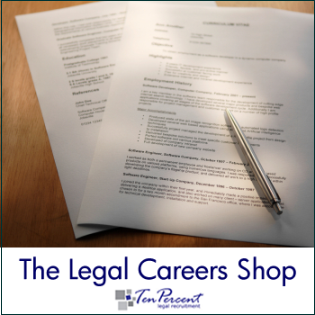 Download the guide at www.legalcareercoaching.co.uk and then visit www.ten-percent.co.uk and read some of the 100s of articles on preparing your CV, completing application forms, attending interviews, tactics for improving response rates to applications, etc.. etc.. It also includes 15% discount codes for all the items in our online shop. There are no catches and no hard sell. It is simply our guide, written in the hope that law students read it and leave us alone! There are 5 ways to grow your business – increase customers, get customers to buy more, increase the value of each transaction, increase prices or increase efficiency. to increase your prices. He issues a challenge to businesses – if you want to increase your profits in one, easy step, increase your prices by 5% immediately. A quick example would be a conveyancing quote I recently had. We contacted three law firms to get a price on selling a field (sale transaction is less than £20k) and got quotes of £475, £400 and £200. Thinking about it now – if the £200 quote had been £210 it still would have been the lowest price, and if I had been a bit distrustful of the low quote I would still have gone with the medium quote with a 5% increase at £420. Applying this to our own business does not really work, because in recruitment most of our business is on a percentage basis and varies according to the salaries being paid, not the work put in. However to an hourly rate firm (ie a solicitors practice) this could make a big difference. Assuming your firm (limited company) turned over £100k last year with £60k profits and paid corporation tax at 20% on the profits, you would have managed to make £48k after tax. If you increase your prices by 5% you would have turned over £105k, with £65k profits and made £52k after tax. The extra 5% price would have generated you £4k in net profit. Not bad for just adjusting your prices slightly upwards. The downside is of course the annoyed customer who wants to know why the price has just gone up. Peter Hill suggests that you should ignore them and concentrate instead on the vast majority of clients who are happy with the service and as a result will pay to stay. Are you brave enough to try it? We are going to give it a go with one of our non-recruitment businesses. I’ll keep you posted with the results in 12 months time. I recently read an article about saving time – with tips including outsourcing everything you possibly can, delegating as much work as possible and avoiding meetings. One of the tips was to reduce the clutter on your desk because looking for documents and items can take up so much of your time. Apparently most of the stuff we file away never gets seen again and in fact it would have been better to bin it from the outset. There is a professor in the USA who tips all his paperwork each month into a desk drawer and at the end of the month he throws the whole lot into the bin. I think this is extremely brave and would never dare to be so bold, but it is certainly one way to get rid of stuff off your desk! There should be no paperwork on your desk at the end of the day – instead it should be in a filing tray, an action tray or the bin. Stationery should be in a desk tidy or drawer. Go and buy some trays at lunchtime and invest in a desk tidy for your pens. It makes the world of difference turning up to work to find a blank slate rather than piles of papers. We received a press release not that long ago from a well known telephone answering service - AlldayPa (www.alldaypa.com - this is not a sponsored link - we don't get paid if you click it - but we are and have been clients for over 10 years now). They have not published any figures demonstrating the 60% increase in the past few years (which is as vague as it gets), but the crux of their research is promoting the fact that it may be worth firms considering out of hours call handling services in order to deal with the increased traffic. Not sure the evidence is capable of backing this up, but there we go! Should you consider an out of hours call handling service? The Law Society seem to have close links with a local company to our North Wales office - Moneypenny are based in Wrexham. They have always been more expensive than other options when we have looked into them and we have explored using a one-man band before now as well to cut costs. I have to say that we do not use a call handling service after 5pm. Many years ago we used to answer calls ourselves after 5pm but over time worked out that the vast majority of calls were a complete waste of time and we were spending valuable out of office time worrying about answering telephones. I got fed up of telling LPC graduates to read our website carefully (we don't offer free careers advice over the phone) and taking long calls from senior partners wanting to get market updates and talk about solicitors with following. If you are considering an out of hours telephone service then Alldaypa have always been good for us - again I should add that this is not a plug for them. When we have had problems with calls they have been able to listen to recordings and relay to us what went wrong if anything. We tend to use them when too many of our staff are out of the office all at one time, or our phone lines are engaged. I would not recommend using them for calls after 5pm as you can start finding the whole experience very costly, and with little reward. You need to think carefully as to why you would need the service. If you are taking a lot of queries in the evenings should you start an on call rota amongst your solicitors? Its a bit pointless having PAs answering calls and taking messages if people are calling you specifically for quotes there and then, or have an urgent legal query. A new survey has been commissioned showing that 4 out of 10 solicitors would NOT encourage anyone to follow in their footsteps. Wesleyan for Lawyers managed to get hold of 103 'lawyers' to conduct this poll, which is pretty poor considering there are over 120,000 solicitors on the Roll in the UK and considerably more support staff and non-qualified fee earners. Very unrepresentative and a bit of a non-news story! However I suspect the real figure is something above 60%. I cannot imagine anyone who deals with the Legal Aid Agency wanting to encourage anyone else to follow in their footsteps. High street solicitors who have not got to partnership status are unlikely to suggest to anyone else that it really is a good idea to run up debts of £44,000 going through the education and training bits before earning a maximum salary of £40,000 for the remainder of their career. City lawyers in my experience seem to hate their jobs, themselves, the long hours and the lack of much of a life, even though they are getting paid considerable sums of money. Whilst they may want to attempt to glamourise their roles in the firms and essentially call it a vocation, I suspect a lot would not suggest following them. Newly qualified solicitors outside the Magic Circle firms must look at their loans and overdrafts and wonder how and why on earth they ever got to the position they are in. Lawyers who have gone off to work in local authorities and as lecturers must again look at how hard they worked, what they gave up and the debts they have had to work through and pay off and wonder why they ever bothered. Partners who spend about 70 hours in the office each week with work at the weekends as well catching up with paperwork are hardly likely to want to encourage anyone else to follow them. Any lawyer who has the pleasure of regularly dealing with the Courts is not exactly going to speak about their experiences with any glowing reference. So assuming there are 120,000 solicitors in England & Wales, I reckon this must surely account for over 60,000 of them. With this in mind, I think the Wesleyan survey is probably not too far away. How many lawyers have called for a plumber or electrician to come and do some work, discovered their daily rate is not far off and sat back and wondered if only? There again, if the same poll was undertaken with GPs and consultants, how many of them would encourage anyone to follow in their footsteps? Are we as professionals always liable to winge about our existence, regardless of how good or bad it is? Jonathan Fagan is a Solicitor (non-practising) and Managing Director of Ten-Percent Legal Recruitment - Online Legal Recruitment for Solicitors, Legal Executives, Fee Earners, Support Staff, Managers and Paralegals. Visit our Website to search or download our Vacancy Database or view our Candidate Database online.